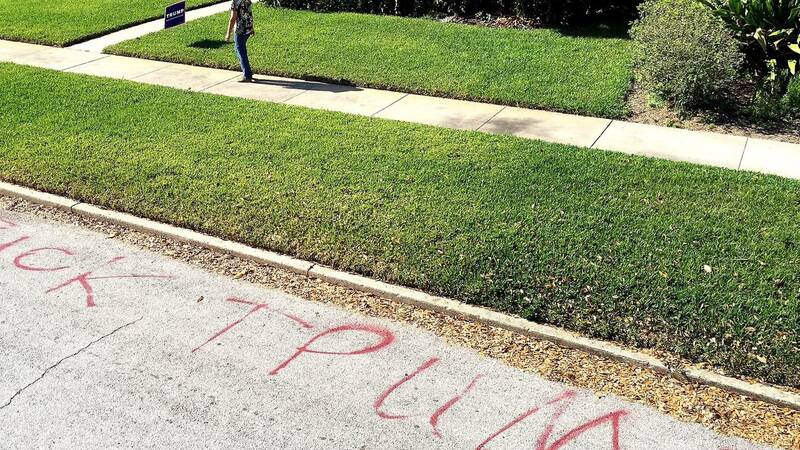 ORLANDO, Fla. - A College Park woman woke up to find the words "f*** Trump," "Nazi scum" and "KKK" spray-painted on her street because she supports Donald Trump for president. Pati Jaeger said she's been living at her home for over 20 years and has never had an issue stating her political opinion in her front yard. But on Monday morning, she said she woke up to the words "Nazi" and "KKK" spray-painted in red to slander Trump and his followers on her side of the street. "It's a shame," Jaeger said. "It's a shame that society has gotten to this point. We put up signs for every election and have never had a problem. They spent $3 on a can of paint and have a red finger. As far as I'm concerned, they just gave a little bit to capitalism." 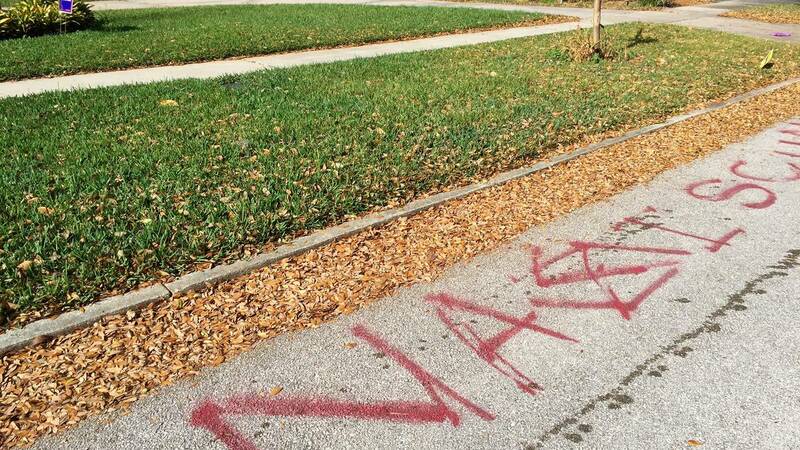 The vandalism stretches across two front yards. Jaeger said she and her neighbor, who also has Trump signs out front, were targeted. "It's a violation, but it's not just a violation to me," Jaeger said. "It's a violation to everyone. It's a violation to everyone that believes in their civil liberties." Jaeger told News 6 this won't stop her from standing by what she believes in. She said she has something to say to the vandal. "I would ask them to sit down and have a civil conversation with me," Jaeger said. "I'd like to hear their point of view (and) they can hear my point of view. It's just as easy as that." Jaeger said she's not intimidated by the words and that she will continue to openly support Trump.